How do I tell if my site is doing anything? The RidgeStar Servers record every use of a Page by a Visitor and retains 30 days of this activity online for your analysis and inspection. We'll try to give you a little more information about each of these mechanisms below. If your site is an Operations type site and has a Segment on the Site dedicated to the management of the Site (e.g. Administrator, Staff, Supervisor, etc. 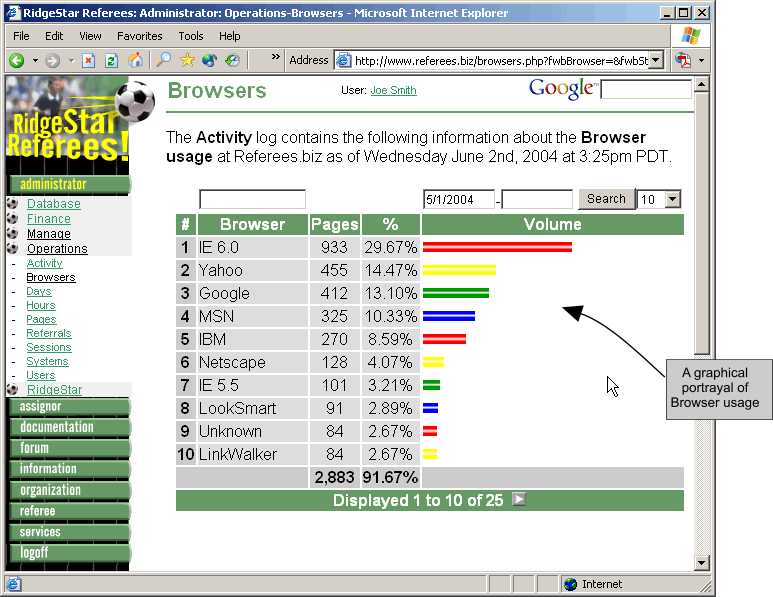 ), you can use the Operations Area within the Segment to gain access to several functional pages, as described below. If you do not have a fully functional Operations site, you can always access the following information by logging onto the RidgeStar site and clicking your way to the Client segment. 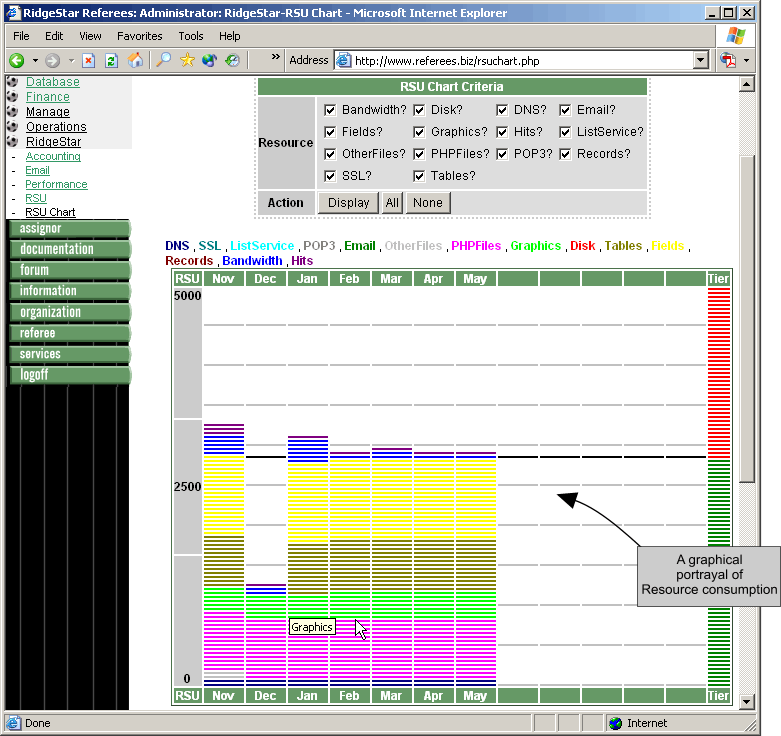 Permits you to see each individual page activity that has been responded to by the RidgeStarServer You can see the IP address, time of day, browser, system, User name (if available), as well as the response time it took the RidgeStar Server to respond to the request. Once your Site has been operational for a full month, RidgeStar will begin to post summarized data for you about the overall consumption of RidgeStar Resources (in raw and adjusted values) required to service your site. You can see these values online by using the RidgeStar Area of your SiteManager Segment or by logging onto the RidgeStar site and clicking your way to the Client segment. Provides direct access to the adjusted numeric values associated with the raw data values available in the Performance function. See Reference: RidgeStar-RSUs for a little more information about what an RSU is. Graphically portrays your Site's consumption of Resources during the last 12 calendar months. This is the basis for computing the renewal fee associated with continued service of your Site by RidgeStar. Now, we do realize that all these numbers, charts, and terms can be a little intimidating at times. We've done our best to make this complicated situation simple to visually summarize and understand (see the RSU Chart), but also to provide the full detail available for those Clients desiring to look a little deeper. The basic rule of thumb is that the more RSUs or the bigger the numbers, the larger the volume of RidgeStar Resources your site is consuming and the corresponding Renewal Fee will also be larger. If the RSUs and/or raw numbers go down, so will the corresponding Renewal Fee. If any of this is confusing to you or you need help interpreting the activity on your Site, please don't hesitate to contact us and we'll try to clarify it all.